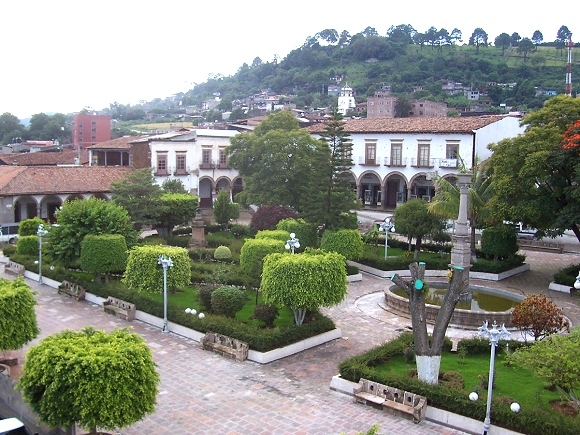 The interesting, but unpretentious, town of Tacámbaro in Michoacán was awarded Magic Town status in 2012. The town has a population of around 26,000 and is located at an elevation of 1650 meters above mean sea level on the edge of Mexico’s tierra caliente. Its full formal name is Tacámbaro de Codallos, so-named to honor a Venezuelan who defended federalism in the early years of Mexico’s Independence. The town center. Despite a serious town center fire a few years ago, there is plenty to see here, including an old chapel around the corner from the main church. The Hotel-Restaurant El Molino (The Mill) located near the entrance to the town. The main restaurant building is a converted, museum-piece nineteenth century flour mill, complete with grinding wheels. Simply and artistically decorated and furnished, this hotel-restaurant has an excellent fixed-price mid-day meal (comida) with subtle sauces and a varied menu. Though not normally open to the public, a few minutes outside Tacámbaro, is the private hacienda-studio of master printer Juan Pascoe. Pascoe produces superb quality, limited collectible editions, using one of the oldest printing presses still in operation anywhere in the world: an R. Hoe Washington handpress dating back to 1838. One of the more curious incidents in local Tacámbaro history is the so-called “Pardon of the Belgians” in 1865. Later in the ensuing fighting, in a last ditch effort to prevent defeat, the Belgians produced the family of de Régules and placed them directly in the line of fire. Even that did not stop de Régules who ordered his troops to keep fighting and to take as many prisoners alive as possible. After the battle was over, de Régules had taken more than 300 prisoners, but had not taken revenge for the killing of his family. What a noble act! The events in Tacámbaro are commemorated by monuments in two Belgian cities: Beverlo and Audenarde. Tacámbaro is about an hour’s drive from the city of Morelia, the capital of Michoacán state. Follow the Morelia-Pátzcuaro highway westwards, exiting at Tiripetío (“place of gold”), where a former Augustinian college of higher studies, one of the earliest in the Americas, founded in 1537, has been restored and now houses an invaluable historical archive. From Tiripetío, follow signs for Villa Madero, and then Tacámbaro.